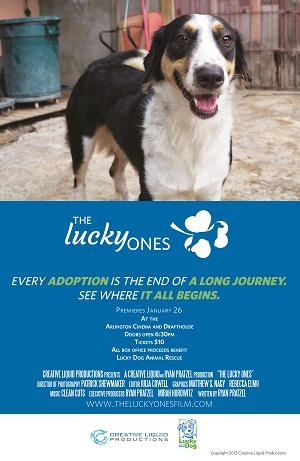 On Sunday, Jan. 26, come show your support for homeless dogs by attending a special screening of “The Lucky Ones,” a film about Lucky Dog Animal Rescue and the organization’s vast network of volunteers and partner facilities. Filmed over six months in 2013, the movie follows the long journey that many homeless animals take to find their forever homes, beginning in shelters and streets and ending when the dogs find their forever homes. Lucky Dog rescues animals from “high kill” shelters located in areas where adoption rates are low and spay/neuter rates are even lower, who are forced to euthanize to create space. Tickets are just $10, and all box office proceeds will go to Lucky Dog Animal Rescue. The 7:30 showing is sold out, but a 10:00 pm showing has just been added. Don’t be a wimp! Ten o’clock is NOT too late. And there are tons of great restaurants nearby so you can go out for a nice dinner, like Maruko Sushi right next door to the theater. Or, just about a quarter mile east on Columbia Pike there’s Taqueria el Poblano, William Jeffries Tavern and Eamonn’s a Dublin Chipper, among others.